I don’t have a degree in chemistry and so most of these ingredients are not familiar to me. However, I do recognise the first one. I always think it’s a little amusing that companies prefer to refer to water as “aqua” on the ingredients lists of their products. Presumably this is because they think it’s harder to sell cosmetics if the largest single ingredient is water (even if it’s purified water and it’s essential for making the product work). 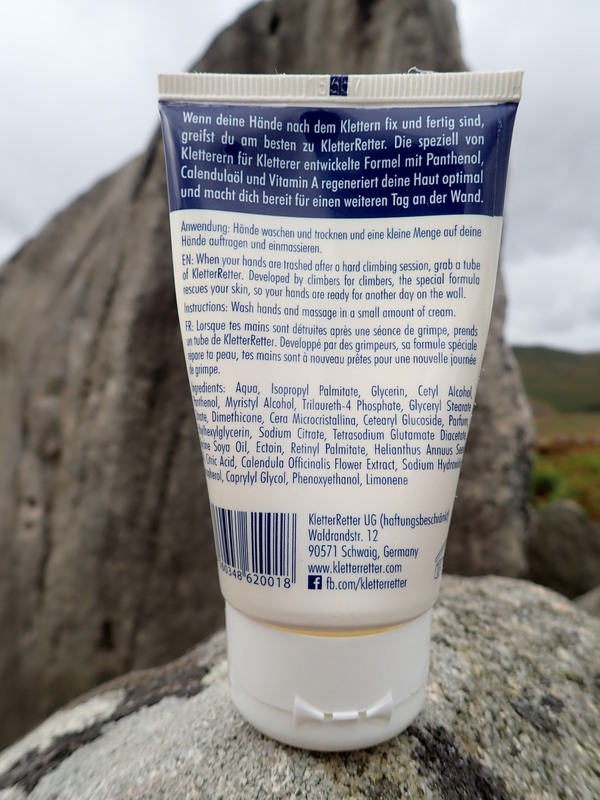 The back of KletterRetter hand cream. The second ingredient is isopropyl palmitate. I had to Google this to understand what it is. Isopropyl palmitate is a chemical compound of isopropyl alcohol and palmitic acid (a saturated fatty acid). It’s a common agent in skincare products as it’s a moisturiser, emollient and thickening agent. Next in the list is cetyl alcohol. This is a fatty alcohol that is used in cosmetics as an emollient or thickening agent. These are the ingredients that make up the higher proportions of KletterRetter, but it’s panthenol, calendula oil and ectoin that the makers emphasise as the active ingredients. This is what the KletterRetter website has to say about these ingredients. “Panthenol (Vitamin B5):KletterRetter gets its anti-inflammatory and wound-healing properties from panthenol. The unique properties contained in panthenol increase your skin’s ability to hold moisture, which means you can stay at the wall for longer. Calendula oil: KletterRetter cares for your skin with calendula oil. Calendula oil contains anti-inflammatory and skin care properties that support and accelerate the regeneration of your skin after a hard climbing session. The website also states that KletterRetter is vegan and not tested on animals. KletterRetter is a white cream contained in a squeezable tube, with a flip-top lid. It absorbs into the skin very quickly. This sets KletterRetter apart from climbing balms based on beeswax and is probably its biggest selling point. Even the best beeswax-based balm will leave your hands shiny, oily/greasy for a few minutes after it’s been applied. This isn’t necessarily an issue unless you want to use your smart phone or touch anything else that you don’t want to leave fingerprints on. KletterRetter is absorbed almost immediately, leaving your hands nicely moisturised and feeling good. Another good feature of KletterRetter is that you only need to use a small amount to get this effect. If you use too much, then it leaves your hands greasy. The makers describe KletterRetter as having a “discreet, natural forest scent”. I think that’s a pretty accurate description. It’s a pleasant smell that I think few, if any, people would dislike. My main criticism of KletterRetter is that the moisturising effect doesn’t last that long when compared to a beeswax balm. That’s meant that I’ve tended to use KletterRetter when I want to apply something quickly and don’t want my hands to get oily. If I’m going to use something to really treat my hands and don’t want to have to re-apply something soon, then I’ll use a beeswax balm instead. I’ve reviewed quite a few balms and moisturisers now, and have used the same scoring system to make it easier to compare them. This gives a score out of 10 for each of the following factors, with 10 being the best and 1 the worst. Application – how easy the product is to apply to the hands. Absorbency – how quickly the product absorbs into the skin and/or stops leaving your hands feeling oily or greasy. Longevity – how long the product keeps your hands feeling nice and moisturised. Smell – this is my estimation of how pleasant, or not, the product smells. It’s a pretty subjective measure, but it’s important, as your hands may smell of a balm for a while after it’s put on. On this basis, I give KletterRetter the following scores. KletterRetter absorbs very rapidly and is easy to apply. It has a pleasant smell. 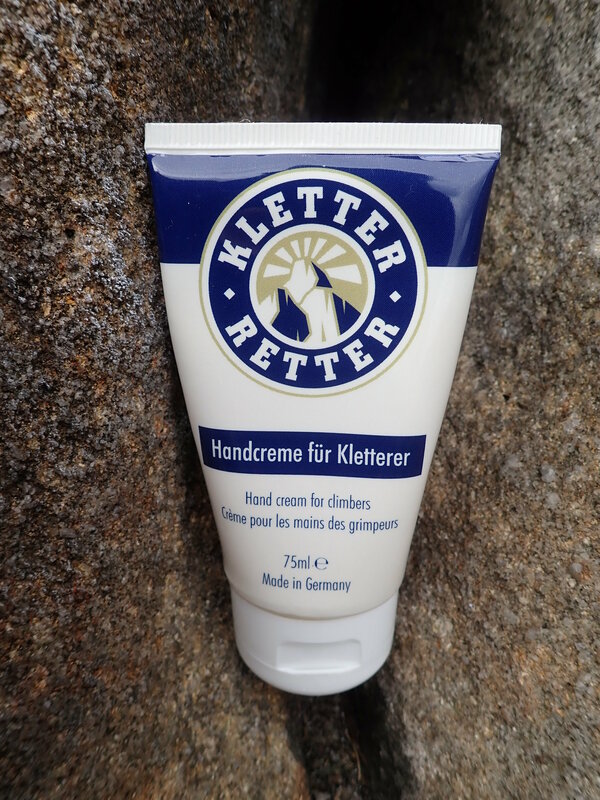 KletterRetter is great if you need something to quickly and easily moisturise your hands after climbing, but you might be better off with a beeswax balm if you want something that lasts longer. Great and well-researched review – not often you get a proper research into the ingredients. I always laugh at the ‘aqua’ too. Glad to see you also mention that it’s not tested on animals – too many people don’t think about this before buying. I’m sure a lot wouldn’t buy some of the products they do if they knew how they were tested! Thank you. You can sometimes learn interesting (and sometimes concerning) things when you read lists of ingredients.